"The work of these two organisations over the last decade had provided the solid foundation upon which artranspennine98 has been built, as the first in a series of recurring exhibitions in this unique region." The Artranspennine98 Reading Room is an installation to be shown at the Artanspennine08 hub space, Manchester, and focuses on the idea of legacy as it runs through the Artranspennine project. 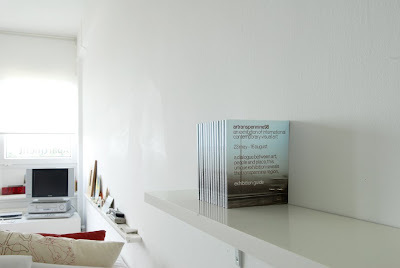 The piece consists of a bookshelf on which are placed copies of the Artranspennine98 Exhibition Guide, a 144 page, perfect bound, publication measuring 12.5cm x 15.5cm. There will be a dozen or so copies of the book. 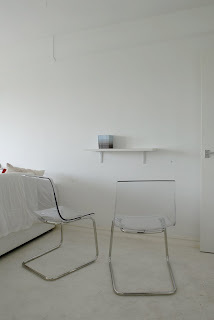 The bookshelf is set at a height of around 110cms – roughly eye height for a seated person. In front of the bookshelf are two empty chairs for the visitor to sit on. The Artranspennine98 exhibition guide is presented as an artefact. We think of this piece as a sculpture rather than an archive, which allows the visitor to reflect upon the development of the exhibition over the ensuing period. The reading room of the title becomes a parody of contemporary museum practice in which reading materials are provided to illuminate the actual exhibition. The redundancy implied in having many more copies of the book than positions to sit and read it reflects the contents of a publication now, for the most part, ten years out of date. However it’s worth noting that a number of the original public projects are still present in the region and the occasional utility of the guide points to larger issues surrounding the continued existence of the Artranspennine concept. Indeed much of the pleasure of flicking through an out of date Exhibition Guide is derived from the chance to make a casual assessment of what has persisted and what has disappeared. In this sense questions of legacy are foregrounded in the work much in the same way that the entire Artranspennine project has become a mediation, by a diverse and growing group of artists, on the legacy of a project initiated as a collaboration between the north’s two leading Museum spaces. That artranspennine98 has initiated a series of recurring exhibitions as originally intended, although through a mechanism quite different perhaps from that foreseen by the founding curators, is the subject of a work that takes the format of the exhibition, rather than the region in which it occurs, as its organising principle. We are particularly pleased that this work affords us the opportunity to collaborate with Lewis Biggs as project curator, enabling his return to an exhibition concept he co-founded over ten years ago.